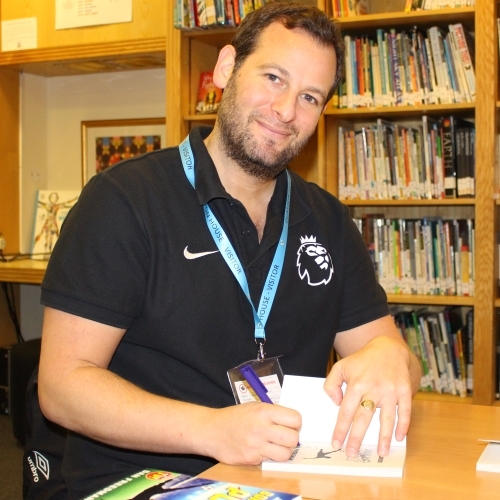 Dan's Big Talk covers his own journey from being a reluctant reader but massive football fan (like so many others) to becoming a football journalist and travelling to two World Cups as a part of the official England Team set up. This experience of working and living with some of the best players in the world inspired Dan to start writing the Jamie Johnson books, which have now been turned into the country's most-watched kids' TV drama. One of the themes of the talk is how one can use your own life experiences in your writing. Another is that reading can come in different forms and it’s truly incredible where your words can take you..
Dan discusses specific examples of where his ideas and characters come from and how meeting the likes of Ronaldo and Messi has been translated into his books about a troubled boy with a dream of reaching the top of football. He shows some of his interviews with top players, the extensive re-drafting that goes into writing a novel (something English teachers are always pleased to hear him discuss!) and also talks about the BBC adaptation of the Jamie Johnson books into the smash-hit TV series. He talks about the challenges that there have been in getting the books published and also getting a TV series commissioned. This is the other theme of the talk: the need for perseverance in going for your goals and rejection being part of the journey. This area of growth mindset is something Dan is aware head teachers are keen to explore and develop. Similarly, Dan also covers the area of sporting excellence that he personally witnessed in the likes of Ronaldo, Messi and Gerrard so those who teach PE are often keen to be involved in the day and session too. He does lots of questions, the girls are just as involved as the boys, and he gives a special prize for the best question. As a general point, we would say that funding and making the most of the visit is something that works best when the Head, SLT and the whole school are involved and on board with the visit. The start of Jamie Johnson's football career. He's got so much to prove, The pressure's on, but has Jamie got what it takes? Jamie's got everything to play for - scouts from top clubs are coming to watch him play! This is his big chance and he can't wait to show off his latest move but the new coach is bearing a grudge...Has Jamie missed his chance? Jamie Johnson is fast becoming the most popular player in the country. He's playing the best football of his career for his beloved Hawkstone. But life at the top of the league isn't as easy as it seems..And Hawkstone are about to sign a new winger.. It's the big one! The World Cup Finals beckon for Jamie Johnson but first he must answer a huge question: Which country will he play for? With brand new characters and jaw-dropping footy action, Dan Freedman and Jamie Johnson return on very top form. Barcelona, the finest club in world football come calling for Jamie Johnson. Signing for the team of legends is just the start of the most dramatic chapter yet in Jamie Johnson's stunning football career. Can the once-in-a-lifetime chance to train on the beaches of Brazil give Jamie the skills he needs to become a legend? The book that inspired the TV series! Special prequel.